February 20, 2017 – To improve service and provide its customers with up-to-date application information, Dayco, a leading engine products and drive systems supplier for the automotive, industrial and aftermarket industries, has released the latest update to its catalog smartphone app. Version 3.0 of the catalog app, which contains technical information and details about Dayco replacement parts for passenger car, light and heavy trucks, buses, snowmobiles, all-terrain-vehicles, motorcycles, and agricultural equipment in Europe, Middle East, Africa, India, South America, Australia, New Zealand and China is now available in the App Store (iOS), Google Play (Android) and Windows Store (Windows Phone). Dayco app and web catalogues are another way the company interfaces with the aftermarket in order to support its customers throughout the lifecycle of the products and systems the company manufactures and sells. Providing the sought-after information enables Dayco customers to have full confidence in Dayco products and reinforces the company’s drive to serve its global customer base. 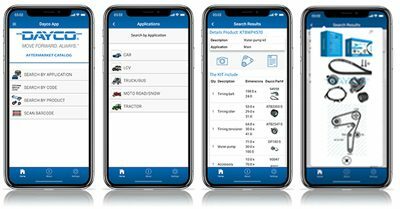 The app includes the most up-to-date catalogue information for more than 30,000 SKUs of highly engineered, mission-critical components for vehicles worldwide. The app, which allows customers from all over the world to search for Dayco replacement from one, global app, includes features such as make and model search via text; direct links to Dayco social media pages; graphic design enhancements. Developed in 2014 and similar to the Dayco online aftermarket catalogue, the Dayco app includes technical information, installation instructions and product spec data in eight languages. Version 3.0 has been updated with a new design to showcase the strength of the Dayco brand and the latest technology which improves performance and functionality. Dayco’s Information Technology (IT) team completely rebuilt the app and this version makes it easier than ever for our customers to access product information and the most relevant vehicle data, such as pictures, routings and layouts, technical instructions and more. With version 3.0, app users also have the ability to switch from region-to-region from the settings screen, giving users the ability to search parts worldwide or in the customer’s specific region. The addition of catalogue information for Australia and New Zealand is also included in 3.0. “We completely rebuilt the app and this version makes it easier than ever for our customers to access product information and the most relevant vehicle data, such as pictures, routings and layouts, technical instructions and more,” said Enzo Rabante, Global IT Applications Manager for Dayco. Dayco web and print catalogs offer aftermarket coverage for nearly 90 percent of the global car parc.